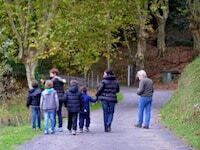 Here are more reviews about Myriam and Evelyne’s French immersion program at teacher’s in the Pays Basque. I was fortunate to spend 2 weeks with Evelyne in December 2016. She is an excellent teacher, very patient and encouraging with a wonderful sense of humour. Evelyne and her husband, Jean-Pierre were very welcoming and I felt immediately at home. As a dog lover, having Vanie (their beautiful golden retriever) greet me each day was a bonus. The combination of 2 hours of formal lessons and many hours of conversation each day gave me the confidence I needed since my primary aim in learning French is to converse with French people. The local bus made it very easy to visit Biarritz and Bayonne and I was able to practice my French. When the locals started to speak to me in English I felt confident enough to ask them (en français bien sûr) to speak in French and they all kindly obliged. Thank you Evelyne for the wonderful experience, the excellent cuisine, the interesting excursions and the many laughs we enjoyed at mealtimes with my efforts in communicating in French. In late September 2016, I returned for a second two-week immersion with Evelyne and her warm hospitality. Once again I made great progress in my language skills thanks to carefully planned morning lessons (this is us during class, talking in French about the US elections), fascinating excursions, and engaging mealtime conversations. Evelyne and her husband, Jean-Pierre, love to laugh and talk. Every day was full of hard work — my French is intermediate level — and lots of fun. I have quickly grown to love this part of France, with the beautiful Pyrénées as a backdrop and the sparkling Atlantic as my view on long beach walks or when relaxing in a cafe. Public buses easily took me from Biarritz to Bayonne, and an inexpensive motor coach made the 45-minute trip to San Sébastien, Spain. This is simply the best way to improve language skills and experience French culture. I stayed with Evelyne and Jean Pierre for two weeks at the end July/ beginning of August. I thoroughly enjoyed my visit, and would recommend it to anyone who wants to study French, as you make more progress staying with a family, and studying one to one. Evelyne is a very warm, intelligent and funny woman, who made me feel totally at ease in her home, and with her family. She is a fantastic teacher, who responds to the individual needs of each student. I was encouraged to be more confident in speaking, and I developed my understanding of the language. I enjoyed seeing different parts of the region, with both Evelyne and Myriam: it was good to listen to different people speaking French, and I found that I could make myself understood more easily as the weeks progressed. Evelyne helped me with my pronunciation, and understanding, and gave me valuable feedback every day. Lessons were structured each day, and did not stop after the formal morning lesson. The writing of a daily journal was invaluable. The house is situated in a perfect location; it is easy to get a bus to either Biarritz, or Bayonne, or to the lovely beaches at Anglet. The room itself is very comfortable, and has both a balcony overlooking the garden and a private bathroom. 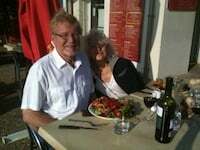 I enjoyed plentiful meals with Evelyne and Jean-Pierre. Evelyne is a wonderful cook, and Jean-Pierre takes great care with his choice of wines. I would love to return in the future to this beautiful region, and would not hesitate to recommend Evelyne as a teacher. I am so very happy I made the decision, after recommendations from friends to come to Bayonne/Anglett to stay with Evelyne for a 2 week french immersion course. Without a doubt it has certainly helped me improve both speaking and my understanding of french. Evelyne is a wonderful teacher, patient, skilled and kind and concentrates on those areas where you feel unsure of. The morning grammar sessions were invaluable and the hours flew by, always so many new things to learn. What a difference it made working one on one, it gave you the chance to correct your faults over and over again! I loved our journeys in the afternoons discovering the beautiful basque region and learning about its history. Both Evelyne and Jean Pierre were very gracious hosts, we enjoyed our meals together with many laughs and excellent food. The sleeping arrangement could not have been better, not only very clean and light but so private. I felt as though I was going back to my own place every evening. The bed was incredibly comfortable and the desk and working space, perfect. I was so blown away by the experience, I am going again next year for another 2 weeks and I cannot wait. Thank you Evelyne and Jean Pierre for making me feel so welcome and all that you taught me. I just returned from spending two weeks with Myriam in Bayonne and loved every minute of it. I spent my junior year of college in Paris 40 years ago, but have hardly spoken French since. When I discovered the immersion programs on the French Today website I knew this was just what I wanted. I chose the Basque region since I had never been to that part of France. Myriam is warm and friendly and we discovered we had a lot in common. She didn’t get frustrated with my slow speed in relearning the language and by the end of the 2 weeks I can’t believe how much I had learned. She was an excellent guide to the region as we went exploring and her pride of the Basque area was evident. 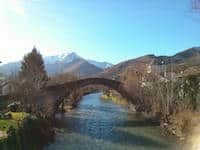 The area is beautiful with the Pyrenees Mountains, the Atlantic coast beaches and the valleys and villages in between. She is also a fabulous cook and the meals were specially prepared to show off the wonderful fresh food in that region. Her house is very comfortable and the bus I took to go shopping or explore areas on my own was just a few blocks away. This was an opportunity of a lifetime and well worth the money. 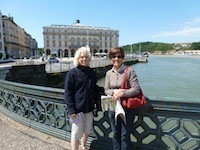 I recently spent a week with Myriam in Bayonne and enjoyed it immensely. Lessons were well structured and added homework gave me the opportunity to test out my knowledge in a safe environment. It was often midnight before I put the books away. This was totally my choice! Things I thought I had mastered a long time ago often needed more work. I also enjoyed the opportunity to speak French continually throughout the week in a variety of settings and with different people. Myriam is a very warm and convivial host. I will certainly consider another immersion stay. 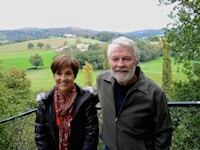 After two weeks of French immersion in Bayonne, I found I could carry on a conversation as my husband and I continued our trip through southern France. Both Evelyne and Myriam are skilled teachers, tailoring their program to the needs of each student. With two hours of personalized instruction every day and non-stop French conversation during meals and outings, my French improved by leaps and bounds. I felt immediately at home when Evelyne met me at the train station. You can tell she truly loves teaching French and welcoming students to her home. My room was spotless and comfortable, with a pretty view of the garden. Evelyne’s husband Jean-Pierre was gracious and kind, as were their family members whom I was fortunate to meet. I loved the regional dishes, French cheeses and local produce that Evelyne prepared. It was fun to meet other students on outings to nearby villages and towns, from elegant Biarritz to colourful Espellete and St. Jean-Pied-de-Port at the foot of the Pyrenees. I spent my second week with Myriam, where I received an equally warm welcome. Each day was an adventure with one-on-one instruction in the morning, a traditional French mid-day meal and interesting activities in the afternoon. We popped down to Spain for a visit to Hondarribia, and Myriam’s friend Martine took me to see the mansion of Edmond Rostand, author of Cyrano de Bergerac. I appreciated having a couple of days to explore Bayonne on my own, using the excellent local bus system and visiting the market and shops, where I bought my fabulous striped espadrilles. Near the end of my stay, my husband joined me. Myriam took us to visit the caves of Oxocelhaya and kindly included us in a memorable family dinner, where Roger found that the international language of soccer made up for his lack of French! My two weeks in Bayonne was more than a language course; it was deep immersion in French culture. I learned so much about French history, customs and current events. This was an experience that I will never forget, and I am very grateful to Myriam, Evelyne and their families for their generosity, warmth and acceptance. I hope to return one day to beautiful Pays Basque. 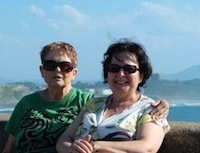 Earlier this year, I flew to Biarritz from London to spend three wonderful weeks with Myriam, Evelyne and Jean-Pierre. Each day, I wrote a journal, which was not only a keepsake of my adventures but also used in daily lessons (to correct grammar, spelling and pronunciation). Although I studied French in school and had lived in Paris for 10 months, I never felt like I had grasped conversational French. When I was asked a question, I struggled to process the information quickly enough to answer back. This not only knocked my confidence but was also very frustrating. I knew I needed to do an immersion course and decided as a New Year’s resolution that I shouldn’t waste any more time thinking about it and just book it. As a young single female, I was a little nervous about travelling and staying with strangers, but having read all the wonderful reviews over the last few years, my mind was put at ease. Both Myriam and Evelyne have beautiful homes and are very friendly, gentle natured and easy going. The lessons are well structured and I learnt far more than I had ever learnt in school! I loved discovering ‘Le Pays Basque’ and visited many places both in France and Spain (St. Jean de Luz, Espelette, Ainhoa, St. Jean Pied de Port, Biarritz, Bayonne, Bilbao and St Sebastian). J’espere que vous allez bien! I will try to keep this short. You and Evelyne were clearly aware of the fact that I was totally out of my comfort zone. You both were very helpful with making sure I was comfortable and helped lower the stress level a lot for me. The accommodations were excellent, the food was great, you both listened to my input on preferences, etc., WIFI was as advertised. I loved the area and really appreciated the fact that you both showed that you absolutely love it as well. I can not think of anything at all negative about the actual learning experience. Your knowledge level of subject matter and ability to get it across was of course excellent; you had no problem explaining anything to me. I would repeat either or both of the stays again without any hesitation. I will schedule the next visit when I can find something like a French cooking class for my wife to do while you help me with the French! The only negative thing about the trip, and it has nothing to do with you, I do not like traveling to the East: I should have arrived two days early to deal with the jet lag. Oh well, next time! Thank you both again for a wonderful experience! Have a great day! A not to be missed comprehensive opportunity for anyone looking for a top notch French immersion program to study the language, and to experience the culture and region. My 2 week stay with the incredibly charming Myriam was an education and vacation all in one. Always with my interests and needs in mind, she meticulously individualized all lessons, excursions and even my individual leisure options. Of the numerous language programs I’ve done in France, living in the home of a French Today professor allowed the most progress by a long shot. Having vacationed in France many times, we were looking for an immersion class to improve our French and then practice it while still traveling in the country. We read the student reviews, and one, in particular, caught our eye. It was written by a couple with different French levels – just like us. 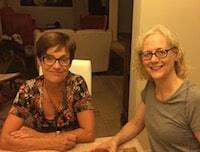 We were very pleased that we could study with Myriam and Evelyne for a week in October. Since they are very popular, we were very fortunate to have booked their ONLY available week! Myriam picked us up at our chambre d’hôte in Ciboure, and that Sunday evening, Evelyne joined us for a delicious meal at Myriam’s. It was a wonderful way to meet them and ease into non-stop French. Each morning, we enjoyed breakfast with Myriam and then had time to prepare for our day. Since my husband was working with her, she would drive me to Evelyne’s home or Evelyne would pick me up. It was nice having some one-on-one time with Myriam. They are very nurturing teachers and provided a good variety of lesson materials and activities. We wrote daily journal exercises to read aloud, gave oral “reports,” and had written assignments. While I worked on grammar and pronunciation and listening skills, my husband worked on writing, discussion and advanced grammar. In the evenings, we enjoyed light meals with Myriam, which she fixed for herself and us. A real highlight was watching a French karaoke television show with her! Two afternoons, we enjoyed lunch with Evelyne and her husband, Jean-Pierre, at their home. Vanne, their dog, was an always-present companion (albeit a sleeping one). These times together made us feel like we were part of French families! 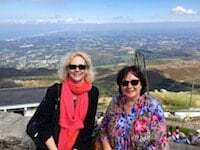 Since we visited Le Pays Basque in 2014, Myriam and Evelyne suggested places that we had not visited for excursions with them. With Evelyne, we went to Villa Arnaga, home of Edmund Rostand, the author of Cyrano de Bergerac, in Cambo-les-Bains. Because my husband is interested in prehistoric French caves, Myriam took us to see the Grottes d’Isturitz et d’Oxocelhaya along with her daughter, grandchildren and some of their friends. It was truly a family outing! She also took me to her spa one afternoon and brought my husband to a nearby ecological park so he could do some bird watching. One afternoon, we visited Biarritz on our own. On our last day, Myriam drove us to the Biarritz airport so we could pick up our rental car. We are hoping to return for two weeks in 2017. Myriam has proposed a bird watching excursion for my husband, and perhaps this time, we will venture into Spain by bus. We are hoping that the karaoke show is still on the air in 2017! I have recently spent two wonderful weeks with Evelyne and Jean-Pierre Vandaele in their charming home at Anglet with the lovely Vanie, their golden labrador and Chouquette, a very vocal little cat. I was met at Biarritz station by Evelyne and in no time arrived at their house where I had my own quarters complete with ensuite, which was perfect in every way. Evelyne and Jean-Pierre are such friendly people and I immediately felt welcome and very much at home. I enjoyed so much the mealtimes when we covered so many topics of conversation. 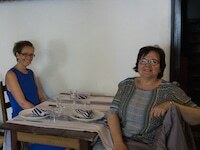 Evelyne is a great cook and I enjoyed discovering the specialities of the Pays Basque region. Evelyne is a very patient teacher and corrected my many errors in a gentle way. During my two weeks’ stay I learned so much more which is possible in a one to one situation. Two or three times a week Evelyne took me to visit the typical Pays Basque villages of St. Jean de Luz, Espelette, Ainhoa, Sare and not forgetting Biarritz and Bayonne,the latter two by bus so that I could become familiar with the transport system. 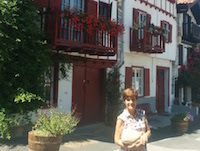 On one particular Monday, which is Jean-Pierre’s day off work, they took me to St. Jean Pied de Port as I had mentioned that my daughter had stayed there and wanted me to visit. Both Evelyne and Jean-Pierre are so generous with their time. I heartily recommend this kind of experience, which is so much more rewarding than attending a structured course of lessons in a group situation. I felt very comfortable conversing with both Evelyne and Jean-Pierre and was grateful that Evelyne corrected my many grammatical errors. Hopefully next time there will be fewer as a result. I have been learning French for 3 years and knew that in order to improve my oral expression I had to spend some time in France. As I had never travelled by myself before, the prospect of traveling from Australia to France alone to stay with a complete stranger was a little daunting. However I had confidence in Camille’s recommendations and the reviews on her site so I took the plunge. Myriam is a lovely lady who goes to a lot of trouble to make sure her student/ visitor is having the best possible experience. Her home is comfortable and clean with all modern amenities. 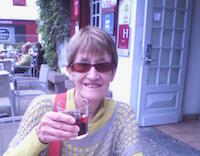 During my time at Myriam’s I enjoyed many delicious meals, met her family and friends, visited picturesque villages, went mushrooming in the Pyrenees, shopped at the local market and in the shopping centres and explored the area by myself using the very efficient bus service and all the time speaking French! In addition to being a very gracious hostess, Myriam is also an excellent teacher. I had 2hrs tuition each weekday and found her to be very patient and encouraging. I returned home with a clear idea as to which areas I need to be focusing on in my future studies. The immersion program offered by Myriam represents excellent value for money and I highly recommend it. I had the most fantastic holiday in a beautiful and interesting region of France whilst having the opportunity to learn and practice French. I just spent two wonderful weeks in November studying French and experiencing French culture and life with Myriam. I had taken several French group language programs before and was initially a bit nervous about spending so much time with just one other person. But my fears were immediately calmed when I met Myriam. She is a warm, generous and gifted teacher who extended herself to make sure I was comfortable in her home and that we together created a suitable language program. I have decent conversational French and wanted help integrating the french grammar i had studied into my speech and extending my vocabulary. And with my never ending struggle to improve my pronunciation. I think I improved in all spheres. What an excellent experience! I stayed with Evelyne for 2 weeks and LOVED every minute of it! Evelyne and Jean-Pierre were such excellent hosts. Immediately I felt at home and was very comfortable. I loved my private room and bathroom with a small terrace to enjoy the garden. I fell in love with Vanille the sweet lab – just what I needed while missing my pup at home. I learned so much more from this experience than I have from past immersion programs. It was a wonderful combination to have casual conversation with Evelyne and her family as well as technical study one on one with Evelyn. She is a fabulous instructor – very patient and funny! Lots of learning and lots of laughs! I loved it so much that I am already booked for next year! Thank You Evelyne! Last year, I read all of the glowing reviews from people who had stayed with Evelyne and with Myriam, which gave me the desire – and the courage – to travel alone and try this immersion program. The positive reviews proved to be absolutely correct. I stayed one week with Evelyne and one week with Myriam in September and the experience truly exceeded my high expectations. Both Evelyne (and her husband Jean-Pierre) and Myriam are truly adept at making strangers feel welcomed, comfortable, and supported. Of course, the first day at Evelyne’s was an adjustment for me. My French is at an intermediate level and I was NOT confident in my speaking skills. However, Evelyne’s and Jean-Pierre’s kindness and easy-going nature made it easy to adjust, and by the second day I was on my way to feeling at home and feeling at ease speaking. With great patience and attention, they waited for me to form my sentences and express myself. With warmth and encouragement, Evelyne corrected my mistakes. The second aspect of this experience that was particularly wonderful for me was the immersion process itself. It was challenging and thrilling – the difference between wading in the ocean and plunging into the surf. Pieces of the French language puzzle fit together like never before as I communicated 24/7 with compassionate, encouraging teachers. Both Evelyne and Myriam responded to my interests and goals with well-thought-out lessons. They targeted exactly what I wanted to improve and identified the gaps in my skills. Finally, the location of the program is ideal. The town of Anglet is between Biarritz and Bayonne, so a 15-minute bus ride took me from Evelyne’s and Myriam’s quiet neighborhood to the lively shops, beaches and cafes of Biarritz and to the ancient riverside beauty and history of Bayonne. Twice-weekly excursions to the fairytale landscapes and towns in the surrounding area completed the fascinating exploration of the Pays Basque. Evelyne and Myriam were jolly, informative guides to all these good places. I have seldom had so much fun and I have already signed up to return next year! I stayed a week in July 2015 with Myriam, who is a gracious host with boundless energy. We spoke entirely in French and it was quite easy to communicate with her on many different levels. She is cheerful, supportive and efficient. I was able to meet her three children, two of her sisters, and a few of her friends. The guest bedroom and bath in her house are well-equipped and modern. Her wifi worked well and it was easy to work on Google. I enjoyed my time with her – never a wasted moment. She tailored our working sessions to my needs as a French teacher. She was very helpful in pointing out little errors, and it was just nice to think/speak 100% in an immersion setting. I am even more comfortable in the classroom this school year than I have been in previous years. This one week really revitalized my French. The morning started at 8:15am with a croissant, yogurt, and black tea with milk. I did find watching TV and chatting simultaneously to be a bit distracting – the subtitles lagged and we were discussing our opinions when the morning show jumped to the next topic. However, it became easier as the week progressed. Next, I wrote a little summary of what I did the previous day, and we discussed it. I showed her my students’ work and we discussed how it could be improved, or different ways to support their learning. Finally, over a cup of tea, we continued with a conversation about something I was reading, found interesting, etc. She and I used Google docs for everything, and I found it quite helpful for taking notes and sharing information with her. We broke for lunch which was always quite delicious – lots of vegetables and fruit. In the afternoon, I explored the region; sometimes with her friend, sometimes alone, sometimes with Myriam herself. I was lucky to be there during “les soldes” and I was able to take advantage. In the evening, we shared a light dinner and fruit. I normally took to bed around 10pm from a well-earned exhaustion. As a side note: My husband did not come; though, he would have been welcomed. Without his presence, I felt even more compelled to interact and be 100% present in the language. When researching immersion courses in France, I was seeking something more than I could get from a group class, and an experience that I could not get in my own country (Australia). At an intermediate level of French, I was hoping particularly to gain confidence in French conversation. 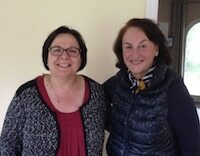 Myriam made me feel very welcome in her lovely home, and my week stay was an incredible opportunity to constantly speak and listen to the French language, an opportunity which I do not believe I could have gained from any other format. My comprehension and confidence in speaking French improved significantly within the week to the extent where, by Saturday, I was able to follow easily a French-speaking tour of Bordeaux. 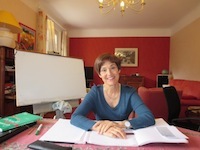 Myriam is an excellent teacher, who put me at ease, was very encouraging and targeted exactly the right level in working with me on valuable aspects of French grammar. This stay also brought the added delight of discovering the Pays Basque with its rich history, culture, architecture and cuisine. Myriam prepared some of the culinary specialties of the region, and every meal was truly delicious! 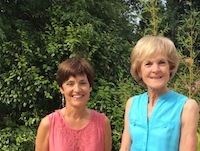 The afternoon outings, with Myriam or her friend Martine, to the charming villages of Saint-Jean-de-Luz, Espelette, and Ainhoa were fascinating. 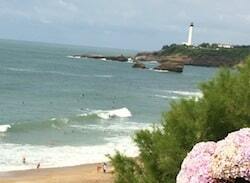 I was also able to take short bus rides to explore Biarritz and Bayonne. If you are looking for an exceptional experience to enrich your skills in French, I highly recommend an immersion stay with Myriam! I want to tell you how pleased I was with the immersion course with Evelyne in the Basque Country. The lessons were excellent, the accommodations very comfortable and charming, the food and wine excellent and the excursions well-thought out, beautiful and informative. I enjoyed my two weeks with Evelyne and her family immensely and I would recommend it to anyone. It is a true immersion with many hours of conversation each day in addition to the daily lesson. I learned a lot about the Basque Country and France as well as making significant progress in grammar, pronunciation, writing and vocabulary. Evelyne takes care to focus on your needs, interests and your level in French. I would definitely repeat the experience. I also had the chance to have dinner with Myriam. Her house is beautiful and I liked her very much. I am sure it would be wonderful to study with her as well. Le Pays Basque is a good choice for an immersion. I have recently returned to Australia, after spending 5 weeks in France. 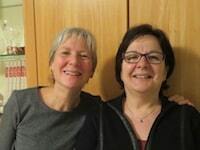 The highlight of my time in France was a week’s immersion course with Myriam Rolando in Bayonne. Myriam welcomed me into her home, her life and her wonderful Pays Basque region of France, including me in all her daily activities and making me feel completely at ease. Myriam is an incredible teacher, a fabulous host and a wonderful cook. Our mornings were spent on structured lessons, and Myriam very quickly assessed my weaknesses and was extremely patient in her explanations and advice. Speaking French 24/7 greatly improved my conversational skills and helped me enormously during the remainder of my stay in France. I would not hesitate to recommend Myriam to anyone, and would love to return for more lessons in the future. I agree with all that has been said about staying and learning with Evelyne’s Family! I was immediately made welcome, and felt very comfortable in my mini-apartment in their home. I came with a different agenda from most. I had felt my learning of French was going slowly and thought that a target was needed. 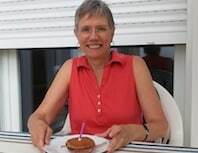 As a retired teacher, I recognised the value of assessment and entered my self for the iGCSE French exam in May (the GCSE exam was not feasible with the need for a 20 hour controlled assessment). Help from lessons in the local Adult Education Centre and from some retired colleagues helped immensely, but the acceleration of my learning in Anglet was phenomenal! Each day started in French with breakfast, this was followed by a 2 hour lesson before lunch. I was initially surprised by the detailed technical approach, but Evelyne had noted the requirements for the exam and coached me expertly for my presentation and oral exam. We went through the written parts of the exam with the same thorough approach. The afternoons were delightful with visits to beautiful areas of the region. Highlights were all patiently explained and reviewed in our coffee breaks, with Evelyne providing a wonderful commentary from her thorough knowledge of the area. It was a measure of my improved confidence that I could discuss, with a waiter in Biarritz, the merits of a latte against café crème (not forgetting the irony that it was made with Italian coffee!). Before the end of the week I even managed to complain at being overlooked in the ‘queue’ at the bar at the top of the mountain and negotiate a discount when buys gifts in the shop at the station for La Rhune! The beauty of the buildings in the old quarter of Bayonne and listening to an artisan explain how he made ‘sword-sticks’ from wood collected in the local forest, was icing on the cake! Evening meals were great fun, exchanging jokes and with Jean-Pierre selecting excellent wines to compliment Evelyne’s superb cooking of local dishes! As part of our humorous conversations, I discovered the equivalent of ‘la plume de ma tante’ is an equally useless sentence used, back in the day, in English lessons in French schools; ‘my tailor is rich’! The week was intense, but that is what I needed. The tuition was excellent and I am certain it made a huge difference to my exam. I probably covered as much in a week as a year from lessons! The ‘social’ time was great fun and I felt part of Evelyne’s family. I recommend anyone reading this to take up the chance of a wonderful experience without hesitation! I learned so much about the region, I must return! A truly unforgettable experience! 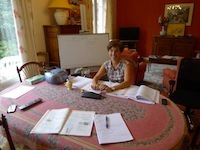 The tranquillity in the home of my private French teachers provided a good learning environment. I spent 2 weeks each with Myriam and Evelyne. They were caring and engaging – each day provided a challenging and unique learning focus. They played teachers, hosts and travel advisers. They shared their local culture and gastronomy from the hospitality of their traditional French homes. I enjoyed going out with them and their friends. The conversational exposure to the native French was a great way to immerse myself. Learning a new language is difficult and at times frustrating. This is a great opportunity to get immersed in a unique cultural environment. Myriam and Evelyne also organised excursions to enhance the learning programme. I departed with fond memories and feeling more confident in speaking ‘la langue de Molière’. The experience was an absolute pleasure and I look forward to returning to their home language immersions. We spent two weeks with Myriam in April/May of 2015. We had a wonderful time. Myriam is an excellent teacher and a fabulous host. Everyday we enjoyed friendly, professional instruction and delicious meals, often featuring local specialities. Her house is well designed- providing comfort and privacy to her students- and perfectly located for easy access to both Bayonne and Biarritz. On the days when we went on excursions with Myriam she was great company as she explained the history and culture of the region. By the time we left, not only had we improved our French, but we felt like we’d made a friend. We’ve already booked our return visit chez Myriam. I spent two weeks with Myriam and one with Evelyne. They are both excellent teachers, customizing our classroom time to my needs and wants. At the same time, having them and their families available to converse with practically 24/7, within the cultural context and without reverting to English after class, was priceless. I think that was key to the progress I made. The area between Bayonne and Biarritz is very easy to navigate by bus. I found it ideal in this regard, not too complicated and at the same time culturally interesting. Early on, I visited the Basque Museum in Bayonne, which I highly recommend. The excursions to the beautiful Basque countryside that Myriam and Evelyne took me on were all the more meaningful after having been to the museum. My excursions culminated in a trip to La Rhune, a mountain on the French Spanish border. There is a quaint, well preserved zipper train which we took to the top. Evelyne altered our schedule so we could go on the day with the sunniest weather and it was well worth it! To the south we saw mountains and valleys in Spain…to the east we saw snow-capped Pyrénées,,,to the north, Basque villages surrounded by lush green fields dotted with sheep, Bayonne on the Adour River, Biarritz and its lighthouse, and the Gascony coast stretching north…to the west St. Jean-de-Luz, the Chateau d’Abbadia, and Irun across the border in Spain. I felt privileged to be included so openly in their daily lives, meeting their families and being a part of their gatherings. Both Myriam and Evelyne are excellent cooks. Sharing meals with them and their families was a delight. I went a number of times to the thalasso-therapie with Myriam, which is an pool sized jacuzzi of filtered and warmed ocean water. We followed the therapeutic bath with a stop in the steam room. I even went to the thalasso with Myriam’s sister during my stay at Evelyne’s. I had studied French in a number of settings, but never in a full immersion like this. If you are serious about learning French, I can’t say enough about how important it is to speak only French, without switching back to your native tongue. Myriam and Evelyne make this possible in a most gracious and hospitable way. I have spent two wonderful weeks with Evelyne and Jean-Pierre in their lovely home in the Basque country. All the reviews are true – Evelyne is a great teacher. She quickly assessed my needs and adapted her classes to my level and goals. My focus was on speaking skills, and speaking I did! Evelyne and Jean-Pierre ensured that I was included in the family conversation at all times, and both were extremely patient with my responses even when I spoke slowly and with lots of grammatical errors. Apart from improving my French and feeling more confident to strike up a conversation, I have also learned a great deal about contemporary French culture and about the beautiful Basque country. The excursions with Evelyne and Myriam were simply wonderful, and ensured that my stay felt like a real holiday. This feeling was fed also by Evelyne’s great cooking, of course! I highly recommend a stay with Evelyne to anyone looking to quickly boost their French while relaxing in a beautiful and comfortable environment. I had been learning French for a number of years at a local Community House, the main focus being on grammar, vocabulary, reading and writing skills. This was all great until I visited France, where I found that other than the obligatory “baguette french” it was difficult to find the opportunity to have a conversation and even more difficult to understand the responses of native French speakers. I had developed a “fear” or “embarrassment” of even trying to speak. Although quite nervous at the thought, I decided to book in for a three week Immersion Program while my husband and I were in France on holidays for 3 months. Firstly, we spent two weeks with Myriam, where she quickly assessed my abilities and customised the formal classes to address my problem areas. At first, I couldn’t understand a lot of what was being said, but then as I settled into the routine, I found that I was understanding a little bit more each day and speaking with a little more confidence on a variety of topics. Outside of class, Myriam also suggested that I do some extra exercises listening to a number of everyday situations and dialogues on a CD. This also helped a lot. Myriam was a gracious hostess and made us feel very welcome in her home, which was warm and comfortable. 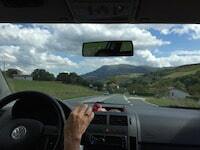 The excursions that she, or a friend of hers, took us on to absolutely beautiful villages in the Pays Basque region or to a relaxing spa centre in the evening, were just fabulous and a lot of fun. Myriam is also a wonderful cook, so all the meals were just “miam miam”. At times we also dined with members of Myriam’s family, who were kind and patient with me practicing speaking French to them, even her young grand children. The third week was spent with Evelyne and her husband Jean Pierre, who are an extremely warm, wonderful and friendly couple. My classes with Evelyne were more focused on speaking and listening, than on a lot of grammar, which helped me build even more confidence. Over the dining table, we had some wonderful conversations and at times we were all in fits of laughter, which put everything on a very informal, fun loving level. Evelyne is a very patient teacher with whom I felt very comfortable. My husband was not interested in doing the actual immersion program, but was warmly welcomed into both homes and he had a lot of fun conversing in a French/English hybrid language which at times was very funny. He of course did and enjoyed all of the excursions. He had lots to “talk” about with Myriam about their love of cooking and Jean Pierre, sharing photos and their love of photography. 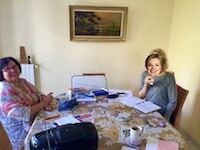 We now have another two months in France, so I am keen to use my new found confidence and skills from what I have learnt from both Myriam and Evelyne and look forward to continuing to improve my French language skills. My first need actually occurred as soon as we left Evelyne’s when the apartment that we booked for a week did not have a view of the ocean, which is what we had paid for. I explained the situation all in French, the receptionist understood what I said and allocated us another apartment, with glorious views of the ocean and the mountains! I was very proud….even if I say so myself! I spent a week chez Evelyne, and it was a truly wonderful experience. As a high-school French teacher, I had visited France many times, but I was looking for a program where I could practice and improve my own speaking skills in an authentic French setting. I had researched language schools, but didn’t really want “classes”. Evelyne’s program was everything I was looking for, and more! Their home was very nice and comfortable, and I enjoyed spending time with the Vandaele family, taking meals with Evelyne and Jean-Pierre and two of their children. They have a lovely family, and I knew when I saw their sweet dog Vanie mentioned on the website that I would be warmly welcomed there. The morning classes with Evelyne were tailored to my particular needs – less grammar, more discussion – but were still challenging and informative. I enjoyed our daily discussions of literature, language, culture, and a review of my journal entries. With Myriam, we visited cities in the region, and I learned more about the Basque country. Evelyne lives near a bus line, so it was easy to get around to sightsee on my own when I had a free afternoon. I left Evelyne’s with much-improved conversation skills, a greater understanding of daily French life, and so much information that I can share with my own students! There is no point in me repeating all the raving reviews about Myriam – all I will say is that they are all true! The comments I had seen here had assured me that I would have a comfortable and fruitful stay in Bayonne, but it turned out to be even better than I expected. Myriam’s competence as a French teacher is unquestionable. I signed up for this séjour linguistique in the hope that it would get me speaking up a storm – Um… actually no, that would have been unrealistic, but I did primarily want to improve my oral communication skills, including listening. Myriam was perfect for that. Even outside normal class time, she was always happy to chat, often over un bon thè chaud and some exquisite Pays Basque sweets. Apart from showing a genuine interest in my (highly interesting!) life, Myriam also had lot of fascinating stories about herself to share, and this made for a lot of enjoyable conversations between the two of us – a great way to improve my French! But Myriam was not just a teacher. She was also an all-rounded host and was very flexible with the arrangements concerning my stay. Indeed, Myriam demonstrated her attentiveness even before I got there – eg detailed instructions on where to find her on arrival, in-depth discussions on my dietary requirements, etc etc, well ahead of my actual arrival. She was friendly and relaxed, with an incredible ability to recognise her new student even without having been given any descriptions (I suppose I did look like a confused tourist no matter how hard I tried not to…). As soon as I saw her waving at me on the platform at the railway station, I felt like I was meeting an old friend, so much so that I felt comfortable talking to her – forgetting how bad my French was – immediately! She was very generous with her time, and with her food also. During my 6 days in Bayonne, I never really had a chance to do any grocery shopping for dinner and Myriam always shared her food with me while we watched «N’oubliez pas les paroles» on TV! Another pleasant surprise was that Bayonne and Biarritz were even more gorgeous than I expected, and the little villages that Myriam showed me were absolutely adorable. All in all, my séjour linguistique with Myriam was just perfect. Evelyne is an excellent teacher – she quickly assessed my level, my needs and wants and developed a customized program. Her feedback (done in a very supportive manner) was very effective. I found the homework (including the journal writing and oral presentation) to be very helpful in reinforcing the learnings. Highly recommend one put great effort in this. I had initially shunned any intense sessions on grammar (silly me) – quickly became evident how essential it is to get the basics right. Evelyne’s love for the region – its culture and history, was very evident and contagious. I can’t wait to return to Pays Basque. Her location is ideal – very close to all modes of public transport – I was able to not only go to Biarritz, Bayonne and St Jean de Luz on my own – but also day trips to San Sebastien and Bordeaux (testing my ever-growing skills to travel independently in France). Evelyne and her family were most welcoming. I had some dietary restrictions – which were well accommodated – food was lovely. We had lots of great conversations, lots of laughs and some very serious discussions. I got a taste of French life – some of which I will try to emulate (like family meal times) and others that I will treasure for a long time. I also was very fortunate in having Evelyne’s friend and colleague, Myriam, take me to the thallasotheraphy on 2 evenings (a truly enjoyable experience) – too bad we could not get in a game of golf too! I greatly enjoyed my 2 weeks. I have a plan (developed with Evelyne) on how I continue my journey to become more proficient in French. I would not change a thing. Many thanks Evelyne for a memorable 2 weeks. I have just returned home to the United States after spending I a week and half chez Myriam. I cannot recommend enough a stay with Myriam. She is a hostess extraordinaire, as well as an excellent French teacher. She is kind patient and encouraging. She accurately accessed my level of French and tailored my daily formal lesson around working on my weaknesses. She is an excellent cook. It was a pleasure to eat regional as a well as other French dishes. As mentioned in other reviews we spoke only in French my entire stay. I feel I have greatly improved my oral skills after my time at Myriam’s. She lives in a beautiful area, which is another bonus. She and a french friend of hers took me on excursions to some of local sites and villages. Absolutely beautiful! It was truly an unforgettable experience. Je viens de passer un merveilleux séjour linguistique avec Myriam. Je suis restée chez elle trois semaines et l’expérience était beaucoup plus que ce à quoi je m’attendais. Even though I was confident with my choice, thanks to the wonderful reviews that I had read about Myriam and her teaching, one never quite knows how things will turn out. I found the previous reviews to be very accurate. Myriam is a very warm, friendly and gracious person who makes one feel quite at home immediately and she is tireless in her hospitality. Her home is very peaceful and the private quarters are very relaxing and restorative; somewhere that you can relax and rest while absorbing and revising the lessons – et bien sûr, pour faire les devoirs. There is work to do each day, but that is exactly what I wanted. My intention in coming here was to really improve my French and, as we all know, that can’t be done without a bit of effort!` After listening to French all day long, there were many days when j’ai la tête comme une citrouille ! French is the only language of conversation spoken. It was exactly what I needed. Before taking this course with her, I was reasonably confident with reading and making myself understood (albeit with many errors), but I found it extremely difficult to understand the spoken word. However this really improved during my stay. The first week I did not understand a lot of what was said, but after that I found that I could get the gist of the conversation much more easily. Myriam has the unique ability to quickly determine exactly what is needed and she structures the lessons accordingly. She is a very skilled teacher and the way that she communicates and explains things (all in French! ) is amazing – so descriptive. Grâce à elle, my listening skills have improved considerably. I have certainly recommended Myriam`s immersion classes to my friends; already one is booked in for next year, with another friend about to reserve a place. Myriam’s family, so testing my French a little more. She cooked lovely meals for me in her quiet house in the Bayonne suburbs, from where I could get a bus cheaply to Bayonne, Biarritz or St-Jean-de- Luz. I can quite understand why she is so booked up – you have to book her well in advance. One week was too short a time to spend with Myriam, but unfortunately it was all I had. I needed to prepare for a month’s work in Mali and I knew my French was not up to the task. The week with Myriam helped launch me. I really appreciated her willingness to help me prepare a lecture on malaria that I needed to give. She now knows more about malaria than she probably ever wanted to know! Her general attitude of practicality toward speaking French was a relief to me. Her patience was exceptional and she seemed to sense exactly how much she should provide corrections in our day to day conversations. 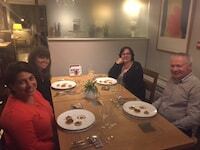 As others have commented, the food was fabulous, and truly made the stay a pleasure. The afternoon trips were a nice chance to get out and about and I loved the spa! I had a birthday during the week and as you can see, Myriam made sure it wasn’t forgotten. Many thanks to French Today and Myriam for this program. For more than ten years I have experimented with immersion courses in the French language during my summer breaks after teaching college history in Honolulu. I have taken courses in Paris, Reims, Marseille, Avignon, Bordeaux, to name a few cities, but none pleased me as much as the French Today program with Evelyne in Anglet, a small attractive city between Bayonne and Biarritz in the historic region of Pays Basque. From the moment I met Evelyne at the TGF train station in Biarritz, I was immersed not only in the French language but in the activities of the Vandaele family. They gathered twice a day at the dining room table– Jean-Pierre, her husband; Simon and Melanie, two of her three adult children; and Vanie, the vanilla colored Labrador whose constant presence in the household assured me that I too had a function—to make every effort to listen to and speak the language, even to this intelligent canine who patiently listened to my endearments en francais. Each day began with breakfast after the others had left for their respective jobs. I cleared my dishes and then worked for three hours with Evelyne as we concentrated on my weakness in the French elements of grammar. After lunch with family members who returned for the midday meal, Evelyne planned excursions to neighboring Basque towns that represented the rich culture of this southwest coastal area. On some days I would use the urban bus system to visit museums in Biarritz and Bayonne to learn more about the region’s rich history, which was completely new to me. Dinner like lunch introduced me to the Basque cuisine that Evelyne excelled in and new wine vintages ably identified by Jean-Pierre. Evelyne’s friendliness and aptitude in teaching me correct French—and most important, her ease in making me a genuine member of the family, made me renew my efforts to continue my studies in the language. Not only was I immersed in the French language, but I became an enthusiastic participant in the contemporary culture of Pays Basque. I spent two weeks with Evelyne and her family in Anglet and it was truly an amazing experience. They were very welcoming and I was immediately made to feel at home. When I arrived I felt very shy as my French wasn’t great despite studying for years at school. I found it difficult to even string a coherent sentence together! But Evelyne was so kind and extremely patient. From the beginning, despite my poor language skills, we spoke only in French and though of course this was daunting, it without a doubt improved my French. I had a 2 hour class in the morning 5 days a week. Evelyne easily assessed the level I was at and we went from there with exercises and examples, Evelyne staying at my own pace and giving more help where it was needed. My language skills improved greatly and my confidence grew. The food was amazing every single day, Evelyne is a great cook, and I miss the French bread and cheese after every meal! Another thing which made my stay unbelievable was that Evelyne was more than willing to show me around the Pays Basque region. This is such a beautiful part of the country with the sea so close and the mountains a short drive away. I got to visit many places and Evelyne was keen to share knowledge of their histories which made it even better. 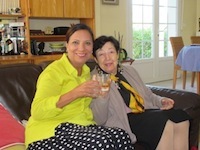 I spent 3 weeks in May with Myriam in her lovely new home in Bayonne. From the moment I arrived Myriam was warm and welcoming. I was initially apprehensive about my limited knowledge of French and about how well I would be able to communicate but I need not have worried because Myriam made me feel comfortable and relaxed. While I could string sentences together in French and have a basic knowledge of grammar before my stay with Myriam I was unable to understand anything that was said to me in French. All this changed with the immersion programme and after a week of hearing only French, I was able to understand more than I could ever have expected to. Having used French Today’s recourses to teach myself French, I have concentrated on listening rather than writing but Myriam encouraged me to write a daily journal which helped immensely with the grammar. She was able to pick up my mistakes and explain them so that I didn’t keep on making the same one over and over again. This crossed over to my spoken French and before long I could hear my mistakes and was able to correct them myself. Myriam assessed my level perfectly and was patient and encouraging with my reticence to speak. As a New Zealander (Miriam’s first student from ‘down under’) I have the ability to speak my own language without moving my lips or facial muscles which makes speaking French impossible. Myriam coaxed me to shape my mouth and move my face to pronounce words correctly and it made a huge difference to my pronunciation which in turn boosted my confidence. Our morning lessons were varied and flexible as we covered grammar, conversation, written work and question time where I could work through the things that I had trouble grasping. By the end of my 3 week stay I was able to talk about various topics, some with complicated themes and my written work improved greatly. 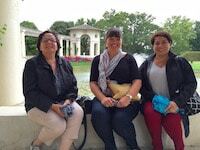 On our planned excursions, either with Myriam or Evelyne, I was fortunate to see more of the Pays Basque region than I would have been able to see on my own and I was able to get to know the towns of Bayonne and Biarritz on the Atlantic Coast well in my free time. Visiting this region expanded my knowledge of France as the culture and architecture is quite different from other areas that I have visited and is really lovely. Thank you Myriam for your friendship, professionalism, excellent teaching ability, the fantastic food and for sharing your daily life, friends and family with me! I have returned home with renewed enthusiasm to keep learning. You will be pleased to know that the improvement I made with you was noticed at my French class this morning. I had been working with Camille for several years and more recently Olivier as well. However I felt it was time for an immersion setting and without hesitation, Camille recommended Myriam. My situation was unique in that my wife wanted to come along as well, but was not interested in learning the language. Fortunately Myriam was extremely flexible and designed a program tailor made around our needs. From the time she picked us up at the airport, to the time she dropped us off one week later, our stay was perfect. Myriam is warm, friendly, gracious and generous and passionate about teaching. Staying with her was like visiting an old friend or relative but with the study of the French language and culture as the primary focus. Myriam’s home is new and modern with a separate wing with a bedroom and bathroom providing privacy for her guests. I still marvel over the automatic shutters and the wood grained Italian tiles covering the radiant heated floors. I don’t think we have anything quite like that in the States. Each morning, Myriam prepared a typical French breakfast. Afterwards, there were two hours of structured lessons, in my case, mostly grammar and pronunciation, with some homework assigned for the following day. (During this time, my wife went sightseeing and shopping with an English speaking guide that Myriam had found for her.) The rest of the day was spent conversing, and French is the only language spoken during one’s stay with Myriam. Having a private tutor at your side all day long to correct your errors as you make them is a pretty effective way to learn. 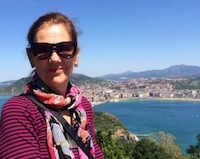 After the lessons, Myriam prepared another delicious meal of either French or Basque foods and in the afternoons, she took us on guided tours of the beautiful surrounding country side, historic Basque villages and even a trip down to San Sebastián, Spain for sightseeing and a meal of tapas. And in the evenings, she prepared yet another delicious meal of French or Basque origin. Afterwards, I would try to get my homework completed before the next day’s lessons. The only wrinkle in our stay was that Air France lost my wife’s suitcase, but Myriam took care of that as well. It took her about a dozen phone calls over 5 days to Air France, but she tracked the suitcase down to a warehouse 50 km from us. She then drove us up there to retrieve it. We never would have found it without her help. Did the experience improve my French? Definitely! I immediately had to do battle again with Air France over double charging baggage fees. I won the argument speaking only French. I could not have done that previously. We spent the following week in Paris and I felt very comfortable speaking. I had a great experience and can’t wait to return. 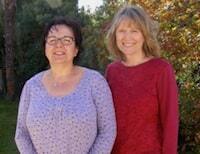 We have just completed a one week French immersion course with Myriam Rolando in her new house near Biarritz. We are the first couple she has hosted who have roughly the same standard of French, so she was able to teach us together. We are able to wholeheartedly recommend this experience. 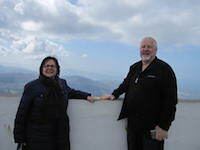 Myriam is very hospitable, energetic and generous, and we felt thoroughly welcome and well looked after. She provided delicious local cuisine, and several stimulating and enjoyable outings to see the sights of a very interesting part of France. She is also a very good teacher and tailor-made a program to suit our needs. Myriam demanded hard work in the ‘classroom’ (!). As well as the daily teaching sessions, each morning one of us had to prepare a journal of the previous day’s events, whilst the other prepared an oral presentation of something we had done in the past (to be delivered without too many notes). We think that Miriam enjoyed the presentation on the Highland Games at Pitlochry (we could not find a French word for ‘caber’ but ‘bagpipes’ is ‘une cornemuse’), as well as the presentation on travel to and from France, starting with a flight in 1960 in a Bristol freighter Aircraft which took cars as well as people. We made distinct progress with our French during our week with Myriam, and hope to further our skills with her assistance before too long. I spent 2 weeks with Myriam and, in short, it was a truly amazing experience. Myriam is an extraordinary French professor whose knowledge and experience in teaching are readily apparent. She quickly assessed my level of competency and tailored the lessons to shore up some of my weaknesses. I found each of our daily 2 hour lessons challenging, motivating, and a lot of fun all at the same time. It was very evident that Myriam simply loves to teach. I think one of the big advantages to her program are the hours of conversation that occur during the day outside the lessons, and the immediate feedback she provided as we talked. It was often a challenge for me to find the right verb or phrase to express what I wanted to say. However, Myriam’s patience with my hesitant speech had no end, and with her consistent encouragement I found myself gaining confidence daily. Myriam is the quintessential host. She is a superb cook and a charming conversationalist. Her new home is roomy and very comfortable. The bedroom and bath that were available to me were modern, private, and separated from the rest of the house by a sliding door. I enjoyed meeting her family and friends, and the excursions to see the sites and villages of the Pays-Basque region where she lives were wonderful. If you are interested in an immersion program, I highly recommend her. I am already planning my return trip! I just spent a week studying with Madame Rolando. I cannot say enough good things about my stay, except that it was too short! Myriam is a marvelous teacher and host, and she does her best (and succeeds admirably) at making her students feel as if they are members of her family. 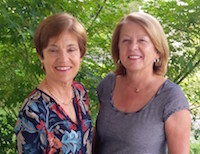 As she has many years of experience as a language teacher she very quickly and accurately established my level of French and tailored my immersion course appropriately. Each day was very full, with homework, lessons in the morning, then delicious home-cooked meals together with her and on many occasions with members of her large family, most of whom live in the Biarritz area. Afternoons were spent exploring the beautiful Basque region either with Myriam as my guide or on my own. There is much to see and do in this lovely part of France–one could easily spend weeks or months getting to know it. We did not speak a single word of English throughout my stay, and I came away feeling much more comfortable about speaking French in a variety of situations. I also came away with a renewed zeal to work on filling some of the many gaps in my knowledge of the French language. Myriam is a treasure, and anyone who spends time with her as their French immersion teacher will benefit immensely from the experience. I have just returned from three fabulous weeks spent with Myriam, her family and friends, and Evelyne and her family. Having read recent testimonials on the web site, it is difficult for me to add anything that has not already been said over and over again: the warmth of the hosts, family and friends, the wonderful food, the excellent instruction, the opportunity to explore and learn about French and Basque culture, the abundant opportunities to speak whatever amount of French one has, all is true! I have had the good fortune to visit France before and have had many great experiences. But finding opportunities to practice my French has always been a challenge. You can only spin out a conversation in the bakery while buying a baguette for so long. You can hardly walk up to strangers in the street and start a conversation about the French Revolution! You can stay with Myriam, use your French, learn so much more and have a wonderful time doing so. My advice to you is to take the leap. Don’t wait. Like many others before me, I want to return too. This was my second visit to Myriam’s immersion course. I was so impressed with my whole experience last year (please see review ‘Helen – 3 weeks-2012’ ) that I just had to return. Myriam was just as welcoming as before from the moment I arrived at the airport in Biarritz/Bayonne. I actually felt like I was returning to see and old friend. I settled in immediately to another 2 weeks of carefully planned lessons, to visiting extraordinary regions of the Basque Country and to sharing delightful dinners and outings with Myriam’s family and friends. classroom everyday french ‘on the streets’ was difficult to understand. However after Myriam’s lessons and conversing with Myriam’s family and friends ( albeit I’m sure clumsily at times ) everyday french became easier to understand and speak. I have to not only thank Myriam for being such a wonderful teacher and host, but a huge THANK YOU must go to Myriam’s patient and warm family/friends that also made me feel so very, very welcome. I’m already planing to return! My 16 year old son and I spent two weeks with Myriam this summer as a combined French intensive and cultural immersion vacation. We had a lovely time and all our goals were superbly met. When we arrived, Myriam asked us what our goals were and then she precisely tailored a program that met all our needs. Myriam is a very warm, attentive, down-to-earth host who is happy to interact with guests or give them space, as they choose. She has an uncanny ability to evaluate one’s level of French and then provide lessons to address identified weaknesses. When correcting, she does not belabor the point; rather she identifies errors and then gives a few explanations and moves on. Myriam is supportive and very patient when listening and does not jump in with her fluent English but allows students to communicate as best they can in French. After our two weeks with Myriam, both my son and I felt empowered by our new ability to communicate effectively in French. Regarding meals, my son and I were quite pleased – the dishes were carefully thought-out and delicious. We loved our discussions with Myriam and our warm inclusion in Myriam’s social activities with her friends and family. In fact, after the first few days, I felt as if we had known Myriam for years and were old friends. Regarding Myriam’s personality, I found her to be a very well-balanced, even-tempered, generous and kind person. Myriam is obviously very bright and a gifted French teacher and host. If you are fortunate enough to set up an immersion experience in France, I highly recommend Myriam’s immersion program. I believe my wife, Bernice and I were the first ‘couple’ that Myriam has had and it was a wonderful experience for all involved. Bernice is at an upper beginner level of conversation and I am at an upper intermediate level, so we could not take lessons together. Instead, Myriam taught me each morning and Bernice went for lessons to Eveline, a close friend of Myriam’s who was an excellent teacher. We were both very happy with the lessons and feel like we made a tremendous amount of progress. We were at Myriam’s for two weeks and I would recommend that length of stay for most students. You are really able to learn a lot in two weeks. 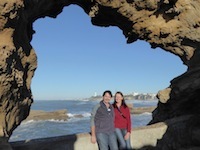 We felt very comfortable making trips into Biarritz and Bayonne on our own. We interacted with people in the shops, on the bus and on the train. We had no problem making purchases at the many stores we visited. We took a side trip to Bordeaux for a tour of the vineyards and also visited St. Emilion. 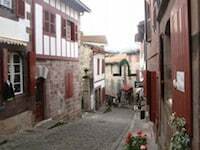 Myriam provided many afternoon excursions to the quaint, picturesque villages and towns in the Pays Basque region. It is a very interesting part of France and it was new to us. We loved exploring the region! The food was unbelievable! Déjeuner was the large meal of the day and Myriam made a different Basque specialty each day. As I’m an amateur cook myself, I loved the food and came home with many great, new recipes. All of the meals, breakfast, lunch, and dinner were superb! The classes with Myriam and Eveline were more than we had even hoped for. We have taken a course in a school setting in France and they were very good classes, but there is no comparison to the classes at Myriam’s. We had private instruction for more than two hours each morning and made unbelievable progress. The one-on-one instruction enabled us to progress very rapidly, as Myriam and Eveline tailored each days lesson to our own particular needs. We could not have learned more in two weeks in any other setting. By the end of the course we were conversing without any hesitation. To sum it up, Bernice and I would give the two-week experience with Myriam and Eveline the highest possible rating. We are already planning a return trip. I was very fortunate to see an advertisement for a complete immersion program with Myriam Rolando on the French Today site. After reading a few reviews I decided that this would be the perfect program for me to help improve my fluency in French as well as gain a better understanding and appreciation of the Pays Basque region. Myriam is the ultimate hostess, teacher and tour guide. From the moment she met me at the airport, I felt at ease. I felt very welcome in her home and was included in get togethers with her family and long standing friends. Daily French lessons were obviously completely focused on improving my specific level of French. Casual conversation improved merely by chatting throughout the day, during trips to local attractions, the market, watching TV etc. The opportunity to talk in French about a variety of subjects is something that happens very often living in Australia. The only part I found challenging was being waited on hand and foot! Not only did Myriam prepare delicious local cuisine but she made sure that she was up every morning before me so she could make a trip to the local boulangerie to buy fresh croissants and a baguette for breakfast. I wish Myriam all the success she deserves and would love to return one day soon and be a guest in her ‘almost finished’ new home – complete with classroom and resource centre for her students. In January, 2013, I experienced an eight-day immersion program with Myriam. Previous to that, I had read all the reviews available on her site, fantasized doing it one day, procrastinated and hesitated, wondering whether the program was really as good as the reviewers described. Having taken the plunge, I am here to tell you that yes, the program is fantastic and the positive reviews are no exaggeration. Having been a former professor, I tend to be quite observant about the teaching and learning process. Myriam is an excellent language teacher who quickly surmises your level, identifies your strengths and weaknesses, and motivates you to achieve your goals. If you have ever wanted a safe and pleasant environment in which you are forced to speak French while gradually becoming better and more confident in the process, this is it! Of course not everything that comes out of your mouth will sound great, but there will be enough times when you form perfectly good sentences that hold up a conversation, and you start to believe that you can do it! Aside from being an excellent language teacher, Myriam is also a keen observer of cultural contexts and influences. Her own multi-cultural experiences include living abroad in a number of countries, and interacting with students from various cultures. She can interact comfortably and work effectively with students from different cultures and backgrounds.. 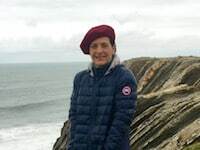 In addition, she is well-versed in both the French and the Basque cultures where her roots are, and makes an ideal guide for the interesting sights of the region as well as the artifacts of the Basque Museum in Bayonne. Myriam is an exceptionally gracious host; this is in part because she is a great cook who likes to share good food and in part because she is a genuinely kind and caring person. She is energetic and hard-working, often going the extra mile to make things better. She is happy to share her family and friends; in getting to know them one realizes that Myriam comes from a close-knit network of good folks. One can feel safe with her. When I went with her to the Thalasso Spa, even with my terrible sense of direction, and blind as a bat in the mist and the salty sting of the seawater, I knew she would find me. From Myriam I learned about French TV and French cinema, and came home with titles of several classic films I hope to watch! If these things do not interest you, rest assured every experience will be somewhat different, because Myriam will tailor it to suit you and your interests. I spent three weeks at Myriam’s house in the beautiful Basque Region of Southern France. From the moment Myriam picked me up from the airport I felt immediately welcome. I would describe Myriam as ‘a wearer of many hats’. Firstly, ( the Tutor’s hat ) she is a wonderful and patient tutor who is able to hone in on your level of French and tailor a program to suit. The lessons were of two hours duration, Monday to Friday, but in reality you were listening to and speaking French 24/7. Secondly,( the Hostess’ hat) Myriam made you feel right at home in her lovely house. My room had a view of the garden and was extremely comfortable and private. Thirdly, (the Chef’s hat ) Myriam is such a talented cook that every meal was delicious. Myriam even went to the effort of cooking quite a few dishes that were typical of the region. 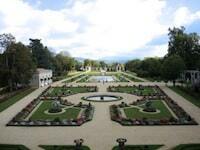 Fourthly, (the Tour Guides’ hat) Myriam took me to some of the most beautiful towns, museums and chateaux. It is quite apparent that she knows the history of the Basque Region and is very proud to share it. Every outing was a wonderful experience. Myriam made such an effort of introducing the culture of her everyday life into my French experience that I was even invited to dine with her family and friends. On my free afternoons it was so easy to catch the local bus to do my own leisurely exploring of the exquisite towns of Biarritz and Bayonne. Learning French with Myriam was such a great alternative to sitting in a classroom all day. My knowledge of the French language and French history has greatly improved. I would not hesitate to recommend this French course to anyone. I only hope it doesn’t get too popular because I definitely want to go back again! Merci beaucoup Myriam! This spring I had one of the most rewarding experiences of my life, studying French with Myriam Rolando in her immersion program in Bayonne, France. Though I studied French in high school and university, my conversational skills were never very good. Many years later I still yearned to be able to speak and understand French, at least well enough to travel independently and confidently. I made some progress studying independently and I found your recorded materials to be very helpful. I found a native French speaker to tutor me and help me with my conversational skills. But I was becoming discouraged that my progress was so slow. After reading your recommendation of Myriam’s program and the reviews of some of her past students on your website, I contacted her and thought she would be a good match for me. Off I went to spend three weeks studying with Myriam and having a wonderful time doing it. She is a gifted teacher and was able to quickly assess my needs and tailor both the formal instruction and her conversations and informal activities to my level. Though I was challenged, I never felt inadequate, and I made a lot of progress very quickly. I also had a lot of fun. Myriam is warm and friendly and included me in activities with both her family members and friends. We made many excursions to traditional Basque villages in France and Spain as well as to the beautiful cities and resorts on the Atlantic coast. We even managed a trip to Bordeaux. Everywhere I looked there was breathtaking scenery, art, and architecture. Since my only previous time in France had been in Paris, our trips really opened my eyes and my heart to the diversity in the French culture and the beauty in other parts of France, and I can’t wait to go back and see more. Because I wanted to stay longer than Myriam had available for me, I also spent a few days with her friend Evylene. Spending time with another French family, all of whom were willing to speak French with me, took away most of the anxiety of wondering if I would be able to converse with people other than Myriam. Did my French and my confidence improve? Absolutely! I spent a week in Paris after leaving Myriam’s home, and I spoke French the entire time and I understood most of what was said to me. I am excited by my progress, motivated to continue studying and learning on my own, and I have already decided to go back to Bayonne to study further with Myriam. I really feel that with her help I can fulfill one of the dreams of my youth, and I could not be happier with the whole experience. Thank you for the “introduction”. Spending a week with Myriam was one of the best decisions I’ve made for my French. From the time I stepped off the train, I was completely immersed in the language. Every day I had a two hour lesson with Myriam, which focused specifically on my areas of greatest need – mainly the “connectors”. While I’ve had many amazing French professors in the past, in a large classroom setting it is difficult to stop class and get a personal explanation for why the language works the way it does. By the time I met Myriam, I had spent several years in school studying French and found that my language was a mish-mash of rules that I understood well, those I had forgotten, and others which I never understood. Working with Myriam was such a natural way of learning that even when I felt frustrated by small grammatical details, she was able to give me concrete examples and explanations. While I worked with Myriam, I spent the week living with another family. Evelyne, my host, and her husband and children (and very excitable dog, Vanille) were incredibly gracious and made me feel like part of the family. They made sure that I was truly immersed in French – I talked in French from the time I woke up in the morning, until I went to bed at night. Evelyne went beyond my expectations and made sure that I was always full (she is a great cook) and that I had an opportunity to explore the region. While I didn’t have the chance to stay the weekend, we used all the time we had to explore closer cities like Bayonne and Biarritz, which introduced me to the diversity of the Pays-Basque region. I would highly recommend this program for anyone that wants to learn French or refresh what they already know, in a relaxing setting while exploring all that France has to offer outside of Paris! “This was my second immersion stay in France. The first time I rented an apartment and attended school during the day. Although I enjoyed my experience, the school and teachers were excellent, after class I returned to an empty apartment. My immersion experience with Myriam combined excellent instruction with comfortable accommodations, delicious home cooked meals, excursions, along with hours of conversation. I felt very connected to the French culture. Myriam shared her home, her family and friends, her knowledge of the region along with formal lessons. Everything about my experience was positive. 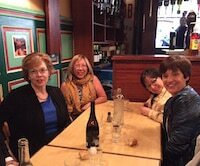 I just got back from spending 2 weeks with Myriam Rolando in her home in Bayonne from Jan 29 – Feb 10th. It was wonderful! She has great attention to detail for the french language and she works very hard with you until you grasp the concept. Her patience, hard work and dedication to what she does is amazing and she shares her friends and family with you. I spent a wonderful time at Myriam’s house in Bayonne. Myriam’s warmth and generosity together with her patience and excellent teaching skills made the immersion program a very pleasant and enjoyable experience. 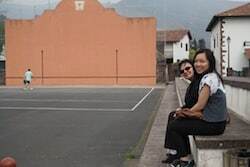 Not only did I learn a lot of French – Myriam brought me on different excursions to see villages and sceneries of the beautiful Basque landscape. I even got to see a glimpse of the Way of St. James! The days started with a private lesson in French, and the afternoons I spent either with Myriam on an excursion or went off by myself to a nearby village with the local bus. I enjoyed walking around feeling the atmosphere of the picturesque French villages, watching the scenery of the coast or botanizing in a bookstore. Myriam also let me taste delicious Basque meals at her home, and invited me to meet her friends and family. I was surrounded by the French language all the time. We discussed different topics and I learned about the French culture and mentality. I had a wonderful time and I highly recommend Myriam’s immersion program! Myriam is a very thorough and patient teacher. I had several questions on French grammar that I did not fully comprehend from my community college classes, and Myriam explained them to me very patiently until I understood. Studying with her was just like studying with my professors at the community college, but it was better because I was the only student. The program could be tailored exactly to what I wanted and needed. I spoke French from breakfast time at 8:15 in the morning until I went to bed at night! I couldn’t believe how much French I could speak. Myriam brought up various topics for conversation and I really enjoyed talking to her. After 5 days, I felt very confident of my ability. I felt very comfortable staying at Myriam’s house. My bedroom had everything I needed for my comfort, convenience, and for doing my daily written homework. The wifi worked very well. Myriam cooked three wonderful meals (she was kept very busy! ), including some Basque specialties. I loved the Bordeaux wine we had with our dinner! Most of all, I enjoyed the various conversations we had (in French!) during our meals in a relaxed setting in her garden. She took me to visit Bayonne, Biarritz, Esplette, Ainhoa, and San Sebastian in Spain. I also had one afternoon on my own to visit where I wanted and it was a great opportunity to actually use French in a practical setting. I vacation in Europe annually, and have been to France 4 times before, but I found visiting France with Myriam to be much more informative and interesting. And I had the chance to find out first-hand about French culture and customs from a native, which really added to my French experience. I hope to study with her again in the future. She is an excellent teacher, the program is highly effective, and I cannot recommend her highly enough. I was fortunate enough to spend a week at Myriam’s home, and it really was all that you could wish for from an immersion experience. Myriam generally only takes one student at a time (unless by prior arrangement – eg people go there as a couple) so things progress at the pace that is right for you. Also, Myriam is incredibly generous with her time – she just absorbs you into her life so you really feel that you are experiencing the French lifestyle. On a typical day we would start by watching the morning current affairs shows then have breakfast, followed two hours of structured French lessons. After lunch we would either go on an afternoon excursion together, or I would have free time to explore the region by myself. The first day Myriam took me into Bayonne for a tour of the old town. Other days we went shopping at the local market, visited the Thallisotherapie centre (warm seawater spa) the home of Edmond Rostand (writer of the play Cyrano de Bergerac), or took a drive to some of the old Basque towns in the hills above Bayonne. We also spent a whole day taking a tour through some of the beautiful countryside and Basque towns in France and Spain. For my free day on the weekend I took the train to San Sebastion in Spain, and had lunch at a great tapas bar that Myriam recommended. With this system you get a couple of hours per day of structured learning, but the rest of the day is spent talking and listening to French in a more relaxed setting. It is a wonderful way to learn French, and I was amazed how much I progressed in only one week. I was also impressed by the value for money – for less than the cost of a half-decent motel room you get accommodation, 3 meals a day (Myriam is a great cook), 2 hours of French lessons, the opportunity to speak and listen to French all day, and the opportunity to see a unique region in company with someone who was raised there and who quite obviously loves the place. Camille commented on how much I had improved after only one week of immersion – I felt myself that my comprehension skills improved significantly in the time I spent with Myriam. I have been to other French language schools in France, while living with French families, but my last experience was that I felt like I was intruding into their busy lives and I didn’t get as much out of the experience as I hoped. In contrast, I couldn’t recommend Myriam highly enough – the balance between formal lessons and casual conversational French was just right for me, and the ease I felt in the environment really made learning a lot easier. “Dear Camille, it is with great pleasure that I write this recommendation for Myriam. She is an excellent teacher. She has taught in many schools in the past and now focuses on teaching French as an immersion experience. She is sensitive and understands the learning process including culture shock. She is flexible, basing her lessons on the goals and abilities of the individual student. She also changes her lessons as the student changes during the immersion process. Her home is warm and inviting, just like she is. The bedroom was comfortable and included a desk and chair. There was good WiFi reception for computer usage. The meals were fresh and delicious. I believe she is a former professional chef and purchases her ingredients at the local street market. Going with her to the street market as well as the supermarket was a fascinating experience. There were many opportunities to experience the local culture as well as the day long excursions into the Pays Basque. Myriam is very knowledgeable about her country and the Pays Basque. She is able to discuss the culture and history in words that are understandable. She has also lived in America, so when all else fails, which is very rare, she can add a word or two in English. The student pays for these day long excursions, but I always thought they were very inexpensive. As a single woman, I was very concerned about my safety both in getting to Bayonne and while I was living there. In Paris everyone spoke English so my trip going there was easier than I expected, when I had a question I could ask in English. There was no problem with security in the airport, the train station or on the train. I was amazed at how quiet it is in France. The only noisy area was while I was waiting for my flight home in Paris and I was surrounded by other Americans! 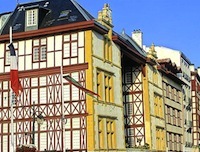 Myriam lives in the city of Bayonne and the neighborhood was extremely quiet. I felt quite safe at her home. Although the formal lessons are two hours, five days a week, the lessons truly are all day. During breakfast we watched the news and discussed the events. If I had a question while doing my homework, she would take the time during the day to help me better understand the lesson. She would correct me as needed, but I never felt any undue stress. She involved me in family activities and with her friends, all of whom were supportive and very helpful. It was wonderful to hear her friend Christine speak with amazing fricatives that I could only dream of reproducing.